The Ipswich-based Falcon Group share a dedication to delivering top quality home and property improvement products and services at competitive prices to their domestic, commercial or trade customers across Suffolk, Norfolk and North Essex. Excellent personal service is central to the ethos of all the Falcon divisions, including its trade / DIY counterpart, Ipswich Trade Frames. 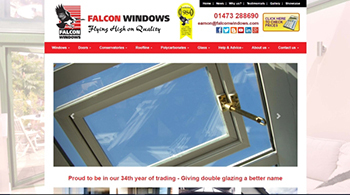 Falcon Windows Ltd, incorporating Falcon Glass and Falcon Polycarbonates was the first in the Falcon portfolio to be established in 1984. With over 30 years in the double-glazing and home improvement business, it is a highly respected company in the Ipswich area with an impressive track record of quality installations, expert personal service and excellent after-sales care. The company has been developed and continues to be led by Eamon Sheppard. 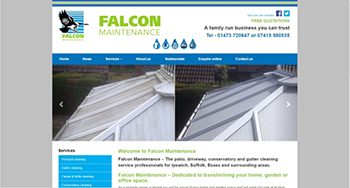 Falcon Maintenance was established in response to the needs of Falcon Windows' customers who wanted access to a local, reliable cleaning and property maintenance service. Services include pressure washing and patio/ drive cleaning, gutter, fascia, soffit and conservatory cleaning, plus UPVC and glass cleaning. The company is led by family member, Carlo. 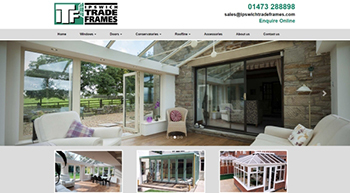 Ipswich Trade Frames is a one-stop trade counter offering high quality, top-branded uPVC and aluminium windows, doors and conservatory system. Architects, individuals with grand DIY designs and independent building businesses who regularly handle installs or who have a one-off particular request from a client find that Ipswich Trade Frames provide everything they need at competitive trade prices. The company is led by Eamon's son, Jordan Sheppard. 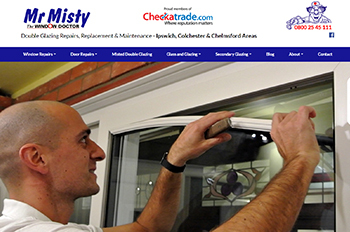 Mr Misty specialises in double glazing repair, maintaining windows and doors to eradicate misting through condensation, reduce draughts and cut back on noise. 'Operations' by the 'Window Doctor' also include the repair and replacement of broken glass, replacing misted sealed units and faulty hinges and all window and door locking mechanisms and handles. The company is led by family member, Joshua Sheppard. ITF Aluminium specializes in luxury, slim-frame aluminium windows, doors and roofs of the highest quality at great prices. All products are energy efficient, strong and long lasting with doors including enhanced security multi-point locking systems. ITF Aluminium bears the Falcon hallmark of honest pricing and advice, excellent experience in the business and impressive product guarantees. The company is also led by Eamon's son, Jordan Sheppard.